TAIWAN FUN MAGAZINE, February, 2006. 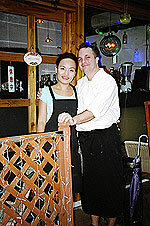 Flavor is Taipei's only Swedish restaurant, where Ola and Stephanie treat you to genuine, traditional Swedish cuisine. This is a true love affair. Ola and Stephanie met while training in Switzerland and, having worked around the world in top restaurants, returned here to Stephanie's home. They opened Flavor to spend more time together, and this love and enthusiasm overflows into the sensational food. 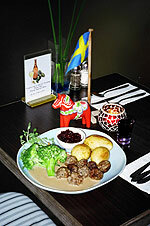 The menu is changed bi-weekly (check website for menus), but always features the famous Swedish Meatballs (NT$470) and the Swedish Orange Ribs (NT$420). The first is served with honey glazed potatoes, lingonberry jam and brown sauce. This was cooked to perfection and, with flavors working so perfectly together to bring out the taste of the food, I was discovering taste buds I never knew existed. The ribs are marinated for three days in an age-old recipe, and all meals are filling, visually enticing and made from scratch using traditional ingredients-often sent over by Ola's mum! All set meals come with soup, bread, dessert and a drink. Fish is also usually offered and, if you can't decide, there's the "Swedish Tasting Menu", a chance to sample five different main course dishes, soup, dessert and a glass of wine (NT$999 per person, min. two people). Or there's even the "Feast Menu" for the extra special dish. From my first bite to my last mouthful of heavenly Swedish Apple Cake wih vanilla sauce (NT$90), I, too, was in love! The weekday lunch menu has a good selection of pastas for a lighter meal, and there is a full bar available. Be sure to try the rich-tasting special flavored schnapps. Although last orders are at 8:30 p.m., they invite you to relax and enjoy the evening in the wonderfully friendly and intimate setting. 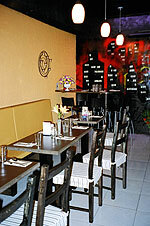 A good experience, they told me, is good food, great atmosphere and a good time. Flavor provides all three in abundance!